Evidence has never been in greater demand; nor has it been more contested. From ageing to artificial intelligence, public health to pandemics, expert advice is being sought across a proliferating array of policy and social questions in almost every country in the world. At the same time, and often on the same issues, the legitimacy of evidence and expertise is under scrutiny like never before. This fast-moving landscape demands new navigational resources. 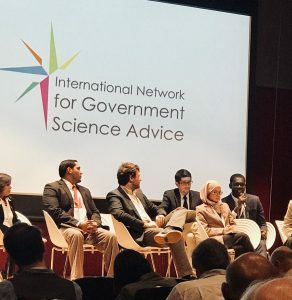 This is why, in 2014, we created the International Network for Government Science Advice (INGSA) to provide a forum for policymakers, practitioners and researchers to share lessons, build capacities, and develop fresh approaches to the use of scientific evidence in informing policy at all levels of government. INGSA now has over 4000 members, drawn from almost 90 countries. Chaired by Sir Peter Gluckman (former chief science adviser to the PM of New Zealand), its secretariat is based at the University of Auckland, with a linked INGSA knowledge hub here at the University of Sheffield, which undertakes comparative research, case studies and other activities to support the network as it grows. Every two years, INGSA holds a large international conference, to bring together the expanding communities of research, policy and practice now engaged in questions about how to improve the provision, communication and application of evidence to decision-making. The 2018 meeting was hosted by the National Graduate Institute for Policy Studies in Tokyo from 5-8 November 2018. 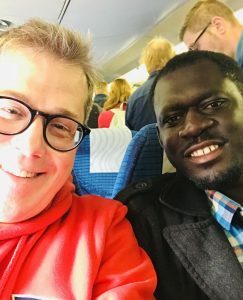 I was delighted that George Asiamah, one of the 2018 cohort of Grantham Scholars, was able to accompany me as the University of Sheffield’s delegation to INGSA 2018, as the meeting’s focus aligned directly with his own PhD research on evidence, policy and food security. Below he offers an insightful overview and reflections on the main themes of the meeting. The significance of scientific evidence in policy-making has long been recognised by researchers and policy professionals alike. With the emergence of the UN Sustainable Development Goals (SDGs), science advice is now more than ever seen as an impetus to enhance synergies and balance trade-offs among the goals. However, the rise in populism and loss of trust in institutions across countries – the so-called “post-truth era” – has made both the demand and supply of scientific evidence challenging. The overarching question is – how do we optimise evidence in policy-making amidst the growing tension between populist politics and scientific evidence? INGSA 2018 sought to provide a collaborative platform for researchers, policymakers and practitioners, including civil servants at different levels of government, to deliberate and attempt to find solutions to the growing conundrum of the science-policy interface. I was keen to attend this conference because its theme – science advice in a changing world – was in direct relation to my Ph.D. project – which looks at science evidence in agri-food policymaking in the UK. Rt. Hon. Helen Clark, former Prime Minister of New Zealand and former Administrator of UNDP, gave the first keynote speech of the conference. She posited that the SDGs are an ambitious agenda that will help transform the prospects of people when implemented. But she admitted that there are enormous barriers standing in the way of their implementation. She emphasised on the need for collaborative thinking – to bring all knowledge and expertise on board – to help advance the SDGs. Other key speakers included Remi Quirion, Chief Scientist of Quebec; Matthew Wallace from IDRC and Klaus Tilmes from the World Bank. Firstly, the need to enhance the capacity of researchers. This should include the provision of funds for research, and also, a comprehensive policy for science to create the environment for independent scientific research. Regular training and capacity building programs should, also, be organised for researchers at different levels. Further, there is a need for scientific collaboration and networking, to enable local researchers, especially those from developing countries, to broaden their knowledge by sharing ideas with experts from different geographical regions. Secondly, in setting the research agenda, there is a need for integrated thinking. This is crucial in the context of the SDGs, due to its complex packaging – an encapsulation of all the major socio-economic and environmental challenges confronting humanity. A holistic approach will assist researchers to identify synergies and interrelations among the goals. Further, a bottom-up approach – involving local authorities, civil society organisations at various local levels – will help transform the SDGs from global-level thinking to solving local challenges. Finally, to ensure effective utilisation of the evidence produced, it is necessary to engage and empower the public to get a better understanding of the scientific facts. Science advice should not disregard the public stake. There should also be regular workshops for policy actors, so they have a better understanding of evidence production processes. 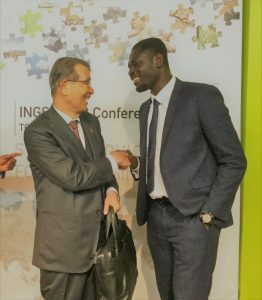 INGSA 2018 was hugely valuable to me, not only for my Ph.D. project but also for my long term career development. My take-home message is that collaborative thinking – the art of bringing in all stakeholders, including the general public and societal norms – is key to maintaining trust in research and vital in enhancing evidence use in the post-truth era. I would like to end by extending my profound gratitude to Professor James Wilsdon for making it possible for me to attend this conference and to the Grantham Centre for Sustainable Futures for their ongoing support.